If you’ve never read a graphic novel, maybe 2012 will be the year. 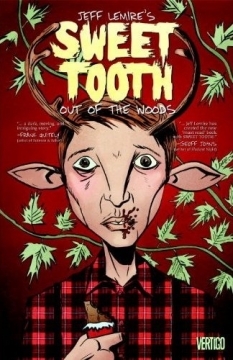 Sweet Tooth, written and drawn by Jeff Lemire, has been described as a cross between Bambi and Cormac McCarthy’s The Road. A decade ago the Afflication raged like a forest fire, killing billions, and the only children born since are a new breed of human/animal hybrid. Gus is one of these endangered children, a boy with a sweet soul, a sweeter tooth – and the features of a deer.